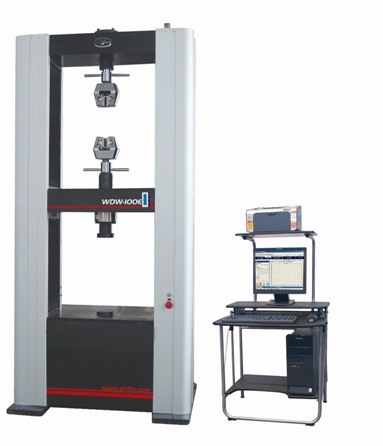 WDW-E Series is a new kind of electronic universal testing machine produced by TIME-Shijin Group, which adopts the most advanced and reliable ball screw electric mechanical load frame structure. The driving system adopts AC servo timing system and motor from Panasonic Co.Ltd.of Japan. The PC controlling system is able to realize the close-loop control of the parameters such as loading force, specimen deformation, and crosshead stroke etc. The system realizes the screen display, online diagram drawing, testing curve changing, pile curve collation and auto analysis of test results, creation of test report. Especially, the application of the control mode can be manual control or computer programming control which makes the cyclic tests become available. 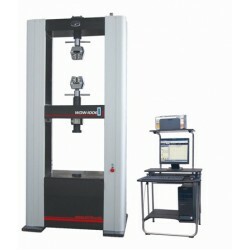 By switching simply of different accessories, WDW series Universal testing machine can make tests on most of materials and components to suit your needs. The specification for WDW-E series shown below is our standard configuration. As the world’s largest manufacturer of testing machine, TIME Group Inc. produces the machines with various and flexible specifications. Including tension distance, tension width, crosshead elevation speed, loading force capacity etc. We supply our WDW-E series with different body frames as well, according to different application environment; we designed and produce Floor type and Bench top type for our customers, and also the interface between machine frames and the computer can be divided into PCI, USB or RS232 by using different controllers. Please welcome to let us know your specialized requirements and let us make one exclusive testing machine suitable for your lab. Complete computer controlled: The whole measuring and controlling system adopts specific PC control card used for testing machines, realizing the data zero and plus adjustment, which has very high reliability. Realizing the database management of the test data which are stored according to the standard format; facilitating other software to analyze and transfer. Perfect programming by auto program control, every control mode can smoothly shift to another one. Fulfilling the test requirement of all kinds of materials with every test standard home and abroad. Control software has the auto-adjusting function of test hardness, which assures that the system works with every kind of specimen hardness. Perfect graphic function realizing the arbitrarily magnifying, decreasing, equaling, adding, indicative display and print of all kinds of test curves, the test point searching as well as the simultaneous display and print of several kinds of test curves. Data processing supposes self-disposing and input disposing of graphic human computer interaction, which facilitates the check and contrast of the test result. The user can self -define the output of the test report, which makes the report format have very high flexibility. Modularization design facilitates the software upgrading, function spreading as well as the second development. All the crucial parts were processed by our owen processing center which was imported from Japan to guarantee the high accuracy of machine. ISO 7500-1, ASTM E4, EN10002-2, BS 1610, DIN 51221, ISO6892. etc. Mainframe: The machine adopt double space door type structure. High accuracy, wide range and stable Japan Panasonic AC servo motor drive the ball screw pair rotating through syn-deceleration system. The ball screw pair drives the middle crosshead and makes the tension/compression/ bending attachment moves up and down to realize the load and offload to the specimen. This structure has enough stiffness to apply high efficiency and stable moving. Key parts are processed on our own processing center to ensure the accuracy of the load frame. Ball screw is E5 class. (2) With the protective function of overload, over current, over voltage, displacement upper and lower limitation and emergency stop.